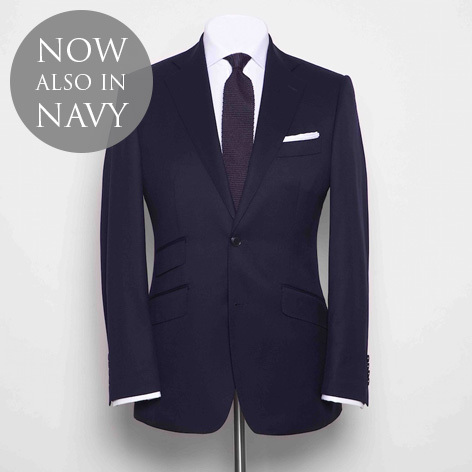 Customers who order the new ready-to-wear Conduit Cut suit (Sharkskin Grey or Navy blue) may add a white double-cuff or cocktail-cuff shirt, a solid-coloured knitted necktie and a crisp linen pocket square, and the whole look (normally priced at £1,000.00) is available for just £700.00 . At checkout enter the coupon code CCSUIT (or CCSUIT2 or CCSUIT3 for two or three suits) and the discount will be applied. Visit the special offer page on Mason & Sons for more details. Sinclair's very first ready-to-wear Conduit Cut suit is available in two body fits: Slim is cut close to the body. Regular is a more relaxed cut, with less suppression at the waist. Sizes are available from 36” to 46”. The Conduit Cut Sharkskin Suit is produced from Super 130s yarn, woven in Italy by renowned textile manufacturer, Carlo Barbera. The suit features a natural shoulder, roped sleeveheads, and a degree of chest drape. Along with the suppressed waist and slightly flared skirt, these create the subtle hourglass silhouette that is the hallmark of the Conduit Cut. 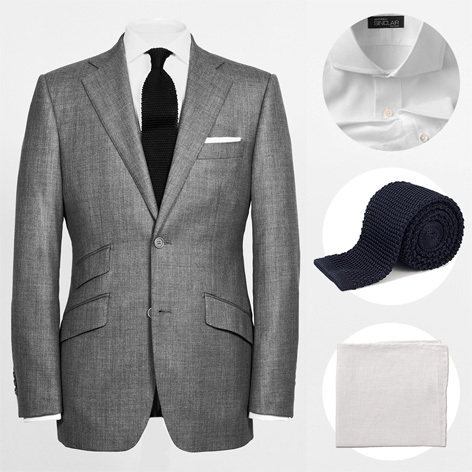 The mid-grey sharkskin cloth and the 9oz (270g) weight make it the perfect suit for any occasion in any season. 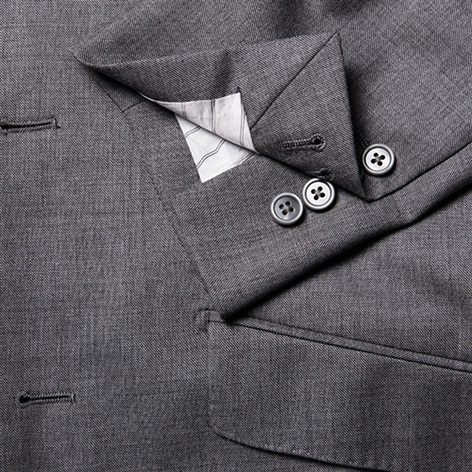 The single-breasted, two-button jacket features two slanted side pockets, a ticket pocket, and welted breast pocket, as well as side vents, working four-button cuffs, and a natural shoulder with roped sleeveheads. 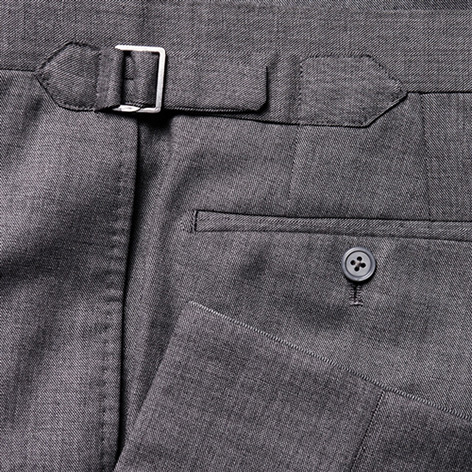 The flat-fronted, plain bottom trousers feature a zip fly, two straight side pockets, two rear pockets and a fob pocket. 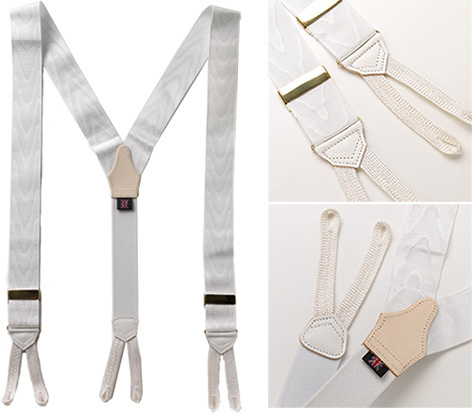 For added comfort and fit, there are also strap-and-buckle side adjusters, as well as braces buttons. Anthony Sinclair has recently added many more interesting Bond related clothing items to their webshop. 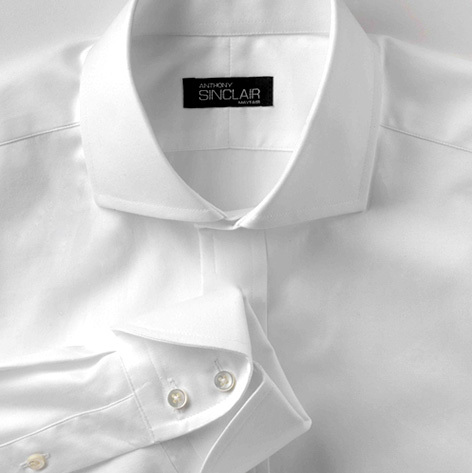 The cocktail cuff or turnback cuff shirt is a must have for any sartorial Bond fan. Get it now with the suit in the special offer. Complete the conduit cut suit with white moiré Albert Thurston Braces with gilt clasp which were worn by Bond in Casino Royale and are still quite popular, available on Mason & Sons (formerly AnthonySinclair.com) for £55 / $79 / €69. Available again are the trousers Sean and Daniel, which were launched in 2013. 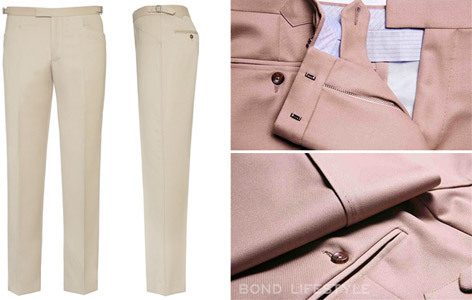 The Sean trousers (pictured above) are very similar to the trousers worn in the Goldfinger chase scene in Switzerland, and the Daniel trousers are a contemporary version of the Sean trousers with a low rise and slim cut. For more British clothing and the ready-to-wear Conduit Cut, visit Mason & Sons (formerly AnthonySinclair.com). Also read the Bond Lifestyle article "Getting the Anthony Sinclar three-piece suit from Goldfinger". Living in Dubai I am always worried about ordering internationally. Not only am i worried about how long delivery will take, but also what condition the package will arrive in. I have to say i am very happy with my new purchase, arrived quickly via registered post, well protected and beautifully presented once taken out of the box. The jumper is a great fit (used the fitting guide for size reference) and beautifully made. Highly recommended, now i just need to travel to somewhere cold so i can wear it…..